Boric Acid, also known as the best Roach Killer, is a known reproductive and developmental toxin, a known respiratory irritant, Demonstrated injury to the gonads and to the developing fetus. high prenatal mortality, Neonatal children are unusually susceptible. There are already 6,463 U.S. cases of Boric Acid poisoning each year. 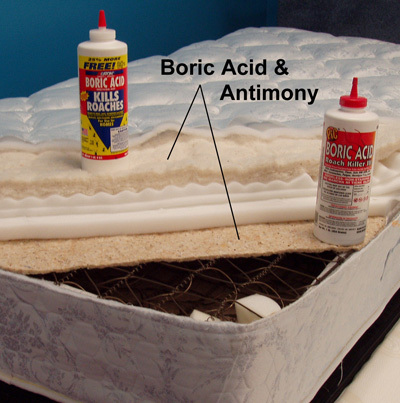 Our calculations show young children could be poisoned by sucking on boric acid mattresses. One human exposure study showed reduced sperm counts and reduced sexual activity in humans. Fatal human single dose reported at: 2g Child, 5g Adult. Prolonged absorption causes weight loss, vomiting, diarrhea, skin rash, convulsions and anemia. Liver and particularly the kidneys may be susceptible. Causes irritation to the mucous membranes of the respiratory tract. May be absorbed from the mucous membranes, and depending on the amount of exposure could result in the development of nausea, vomiting, diarrhea, drowsiness, rash, headache, fall in body temperature, low blood pressure, renal injury, cyanosis, coma, and death. 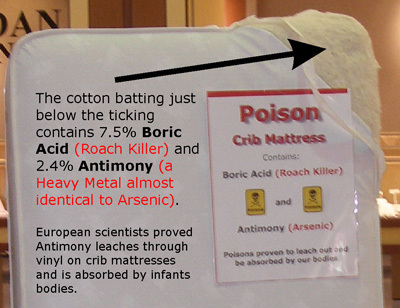 CPSC predicts we will absorb 27 times more Poison every night from mattresses (.8 mg Antimony) than what the U.S. Environmental Protection Agency (EPA) says is safe (.03 mg), and it is likely we will absorb much more than they predict. In predicting we will absorb .8 mg nightly the CPSC assumed, without data, that we will absorb only 2/1,000's of the Antimony that has leached to the surface and contacts our bodies. We know we absorb medicine through our skin from small patches. Studies from the Center for Disease Control (CDC) show six to eight skin applications of Antimony Trioxide, the exact form used in mattresses, applied in a mixture to resemble sweat killed half the rabbits studied.